Plant Description: The Cascara Sagrada is a small deciduous tree that is primarily found in the Pacific region of North America. Reaching a height of fifteen to twenty feet, its leaves are dark green and elliptic with teethy edges. The base of the leaves are round and the bottom side is somewhat hairy. The greenish-white flowers grow in clusters and produce a small pea-like fruit that is black in color and poisonous. 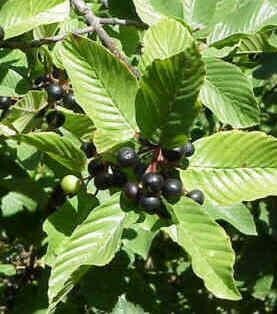 Medicinal Properties & Uses: The bark of the Cascara Sagrada is the desired portion of this plant. While it has been used in large doses to induce vomiting, its primary use is that of a laxative. It actively promotes peristalsis of the intestines. When used in prescribed dosages, it will typically produce a bowel movement within six to eight hours. Constipation is the only ailment that Cascara Sagrada has been clinically proven to be effective against, but there are claims that it will also provide relief for headaches, nausea, high blood pressure, irritable bowel syndrome, gall bladder, and yellow jaundice. Dosage: 30-60 drops in juice or water, 2-3 times daily or as needed. Shake well before using. Cautions & Interactions: Cascara Sagrada should not be used while pregnant or nursing. As with any stimulating laxative, it should not be used for prolonged periods of time.